How stunning and imaginative are these “Yarn Banners”? This is a great way to use up your left over yarn or take from skeins of yarns you never had a use for. This project is a great stash-buster! 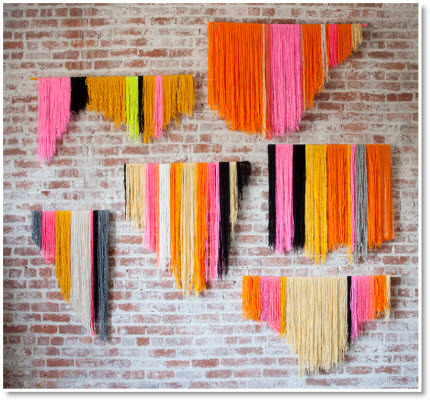 These easy-to-make yarn banners create a bold statement in any room. Courtney (watch her video on her art and read about her) Maker Extraordinaire of “creative bug” says the key is to trim the shape after all the pieces are glued down. Thanks for this amazing idea I will be making these. I just LOVE this site!!!?? ?